Posted on Mon, Apr 9, 2012 : 8:06 a.m.
A two-car crash was slowing traffic on westbound M-14 east of Ann Arbor Monday morning. The crash, involving two vehicles, was on the shoulder near Vorhies Road, a Washtenaw County sheriff’s dispatcher said. Police were at the scene of the crash just after 8 a.m., the dispatcher said. 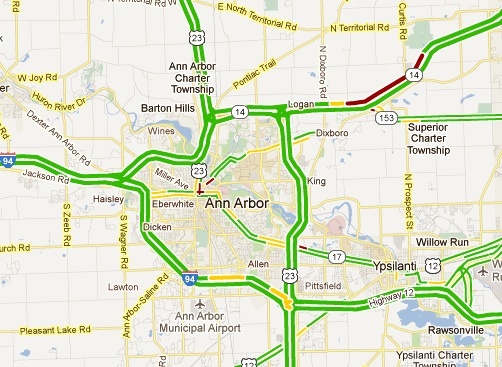 Traffic slowdowns are shown in red and yellow on the map. Mon, Apr 9, 2012 : 3:01 p.m. Slow down people, especially in construction zones. The construction happens all over the state this time of year. You'd think people would catch on to this. Orange barrells, Signs, Equipment and workers. Oh wait what am I thinking. People don't pay attention. They are in too much of a hurry to talk on the phone, eat, read and then freak out cuz they are almost late. Mon, Apr 9, 2012 : 2:42 p.m. Ever since MDOT changed the M-14 westbound at US-23 interchange (back a few years ago, when WB on M-14 looking to proceed SB on US-23, two lanes could exit SB onto US-23) they unintentionally created a bottleneck. This due to now only the LEFT lane of M-14 can exit to SB US-23. So what do the goofy &quot;operators&quot; do? Jump into and hold the left lane of WB M-14 for miles, awaiting their exit to SB US-23. They plug the entire WB M-14 freeway up from the Ford Road interchange just to be certain they can exit! Incredibly. Incompetent. Operators. For they certainly are NOT drivers. Contributory factors to many WB M-14 accidents in this stretch. Mon, Apr 9, 2012 : 1:54 p.m.
Mon, Apr 9, 2012 : 1:10 p.m.